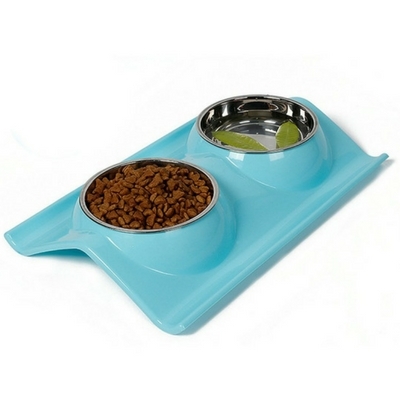 Cat Food bowls come in a variety of different designs. 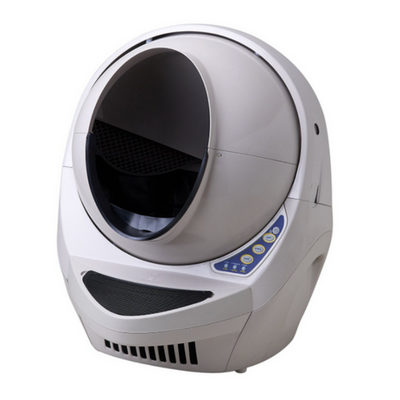 Before you make a purchase, there are a few things worth considering to ensure you get the best cat food bowls for your cat. 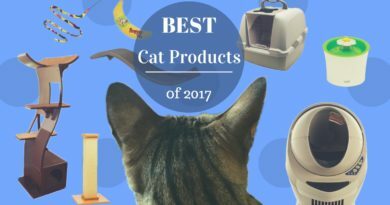 First we'll run through our top-rated cat food bowls, then we'll give you a bit more information to help you with your selection. The Necoichi Raised Cat Food Bowl is a sophisticated cat dish that was designed for cat comfort and owner convenience. 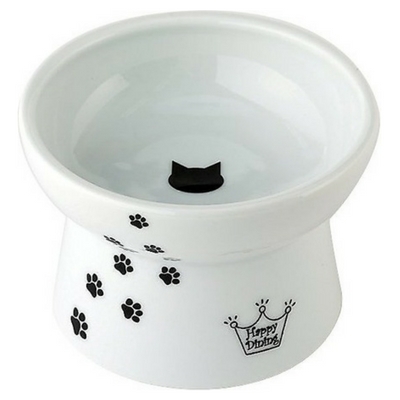 This cat bowl is made of durable, non-absorbent porcelain that's both dishwasher safe and microwave safe. 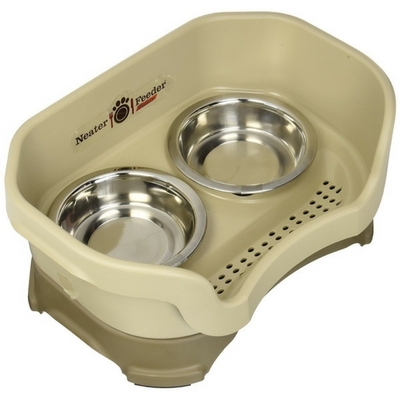 The Necoichi Raised Cat Food Bowl comes in 3 sizes - Mini, Regular, and Large. We recommend going with either the Regular or Large sizes, as the Mini size is incredibly small. Necoichi also makes a matching water dish. 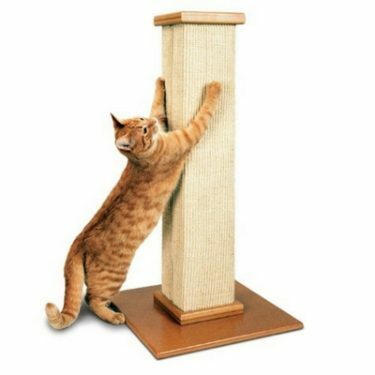 The Catswall Design Raised Multi-Cat Feeder is an excellent product for multi-cat households. 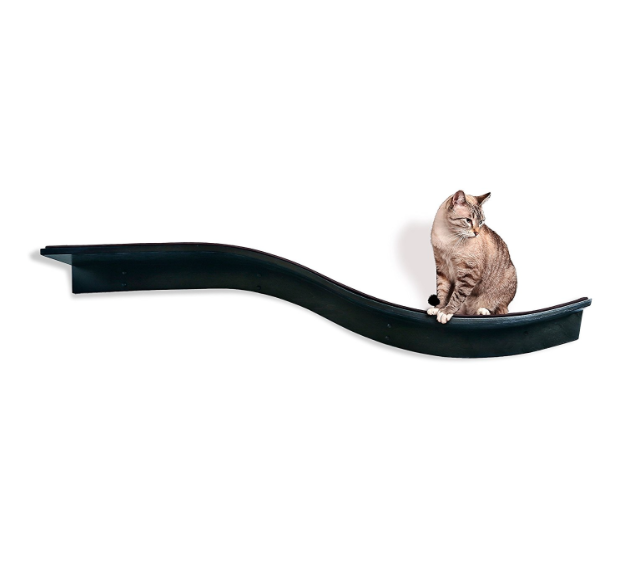 This sturdy feeder is very convenient to pick up using the cat handle. The 2 stainless steel bowls are appropriately sized for food. This cat feeder has a weighted base that is specially designed to keep ants from getting into your cat's food. Catswall even makes a 3-bowl version of this cat feeder. They are also available from Shop Meoow. 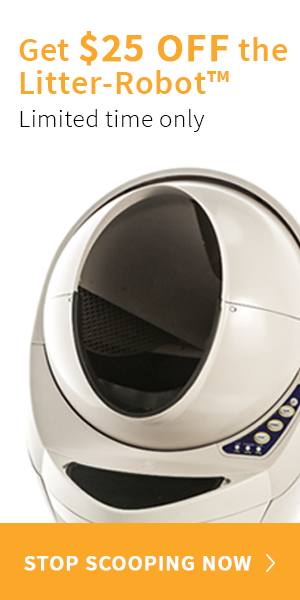 The PetFusion Elevated Pet Feeder in Premium Anodized Aluminum is a low profile modern-looking cat feeder that'll last a very long time. 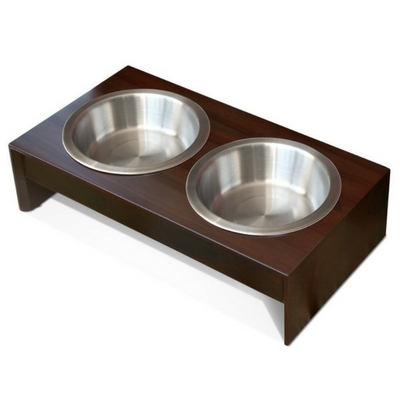 This feeder set includes 3 stainless steel bowls - 2 deep and 1 shallow. It comes in metallic grey or metallic black. The anti-slip feet ensure these bowls stay in place. 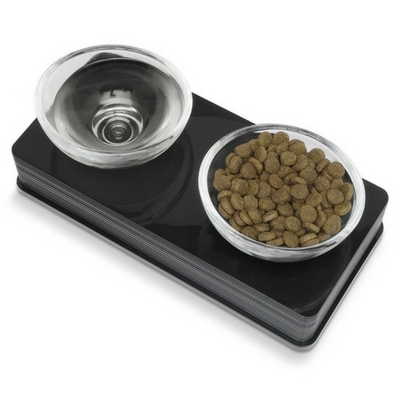 The Pawfect Pets Premium Elevated Cat Feeder is a very elegant bowl set that is made to last a long time. 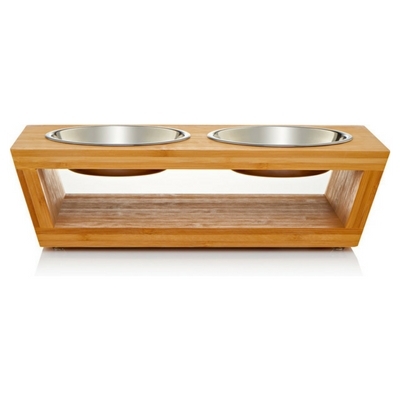 This elevated feeder is made of water resistant bamboo and is virtually impossible for your cat to tip over. Another nice feature about this feeder is that it comes with two extra stainless steel bowls for a total of four bowls. Two bowls are smaller capacity holding 1.5 cups and two are larger capacity holding 2.5 cups. The Catit Style Glass Diner is a modern looking set of cat bowls that not only looks great but is also very functional. 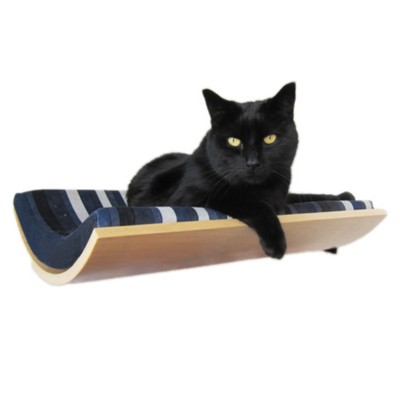 The elevated angled bowls are ergonomically designed to make eating very comfortable for your cat. The rounded bottom is also a lot easier to clean because there are no edges for food to get stuck in. While the glass bowls are dishwasher safe, Catit does not recommend using them in the microwave. 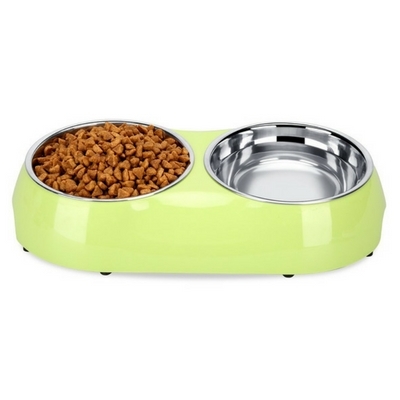 The Luase Stainless Steel Feeder is a great food bowl for cats and small dogs. This double diner comes in two sizes - small and medium. The small is a good size for most cats. The 2 stainless steel bowls fit snuggly in the colorful plastic base, but can be removed for easy cleaning. 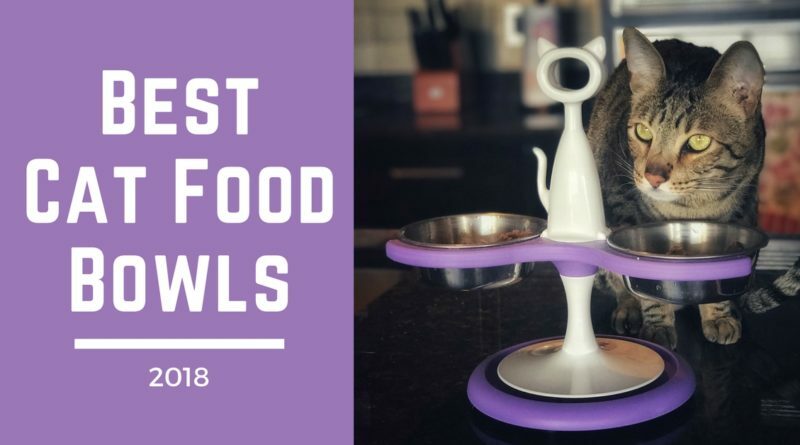 The bowls are pretty close together which could become a nuisance if you have a messy cat and plan on using one dish for water and one for food. Overall, this is a good quality bowl for an excellent price. The PetFusion Elevated Pet Feeder in Premium Solid Wood is a quality set of cat bowls that will blend in with your modern decor. The base is made of New Zealand Grade A Pine and has multiple coats of water resistant sealant. 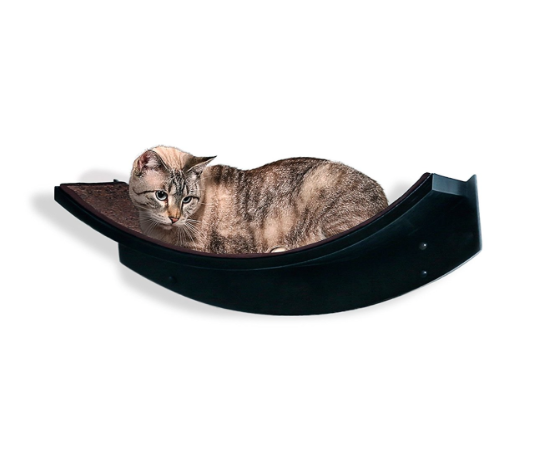 The bowls are shallow and wide enough for finicky cats with whisker sensitivities. The set includes 3 stainless steel bowls - 2 deep and 1 shallow. 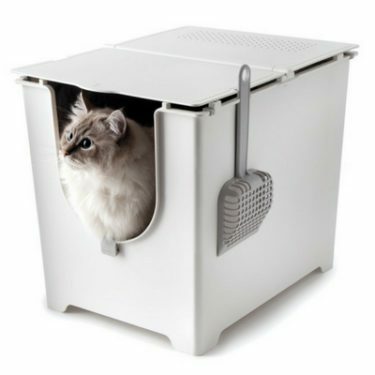 The Neater Feeder Deluxe and Neater Feeder Express for Cats is a innovative solution for messy pets. 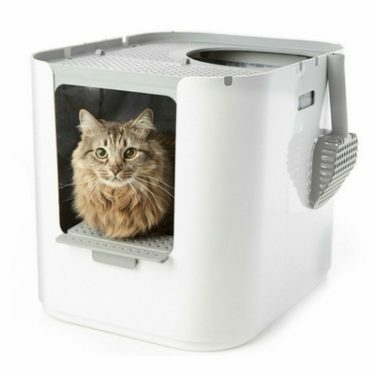 This unique cat feeder is designed to keep all of your pet's food and water messes contained inside the feeder. The top piece sits on top of the base and has drain holes to collect water. 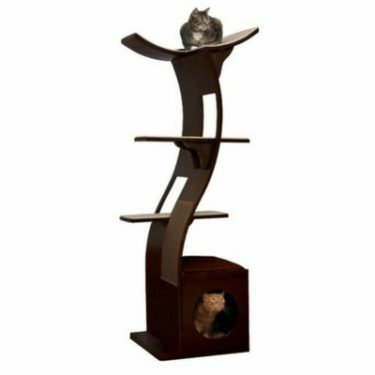 Some cat owners have complained that the two pieces don't fit together snuggly enough to prevent their cat from knocking the feeder over. 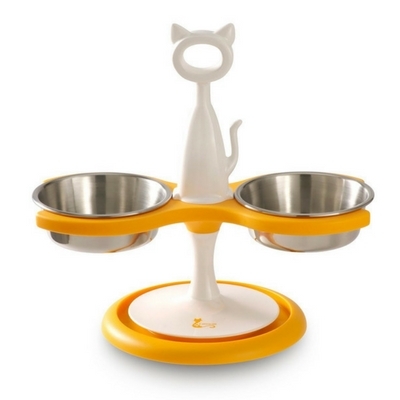 The UPSKY Smart Feeding Station for cats is a practically designed double diner that comes with two 1.5 cup stainless steel bowls. The bowls are dishwasher safe, but the plastic base is not. The base has a built-in lip that is designed to prevent food or water from spilling onto the floor. The Comsmart Stainless Steel Cat Bowls are a very basic set of food dishes with a few features that make them stand out amongst the rest. 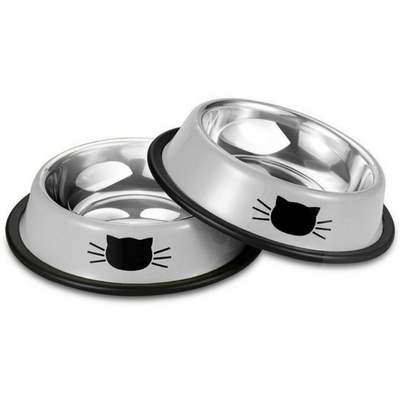 These stainless steel bowls are plenty big for your cat and they have a skid-proof rubber ring on the bottom. 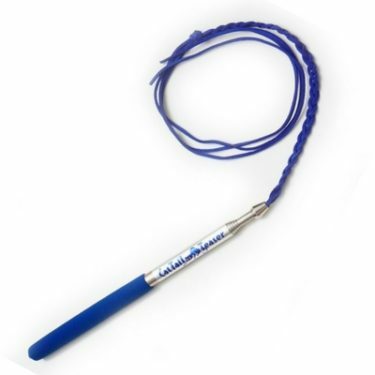 They also come in a variety of bright colors. They are dishwasher safe and super easy to clean. Here's a table showing the approximate capacity and bowl size for our top-rated Cat Food Bowls and Feeders. 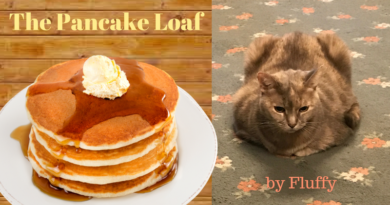 As a rule of thumb, you should have at least one food dish per cat in your house. In multi-cat households sharing a single food bowl will definitely lead to food wars. If you feed your cats a variety of wet food and dry food, it’s a good idea to have dedicated bowls for each type of food. If you don’t use a pet fountain for water, you’ll need another bowl for that. Your typical water bowl should be larger than the food bowls. 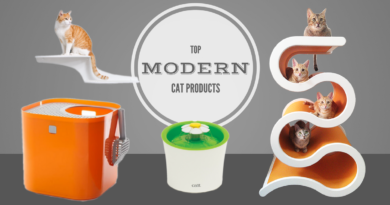 Plastic, ceramic, stainless steel, and glass are the main materials that cat bowls are made of. While plastic food bowls are usually the least expensive, they aren’t recommended because plastic can cause feline acne. Stainless steel bowls are the most common and are very practical because they are rust-resistant and dishwasher safe. Ceramic and glass bowls are good alternatives as well. While they might be more breakable, some have the added benefit of being microwavable. Elevated Bowls – Elevated bowls have an advantage over standard food bowls because they are better for digestion. They’re also more difficult for your cat to knock over. Look for elevated or raised bowls that are between 3" and 4" off the ground. 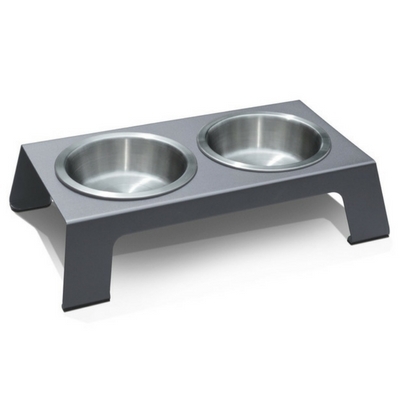 Non-Slip – Look for food bowls that have weighted bases, rubber feet, or non-slip bottoms. Cats can get pretty rambunctious and picking up a hundred pieces of kibble off the floor is not fun. Round Bottom Bowls – Most food bowls are round and have flat bases. 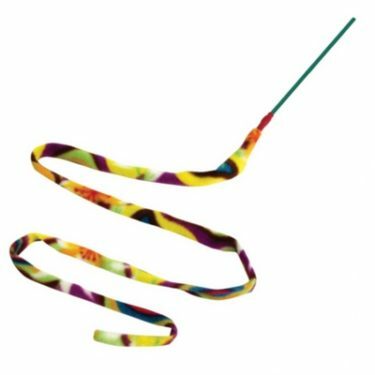 Wet food tends to get stuck in the corners and is difficult for your cat to get and even more difficult for you to clean. Rounded bottom bowls make life easier for both cats and humans. Whisker-Friendly Bowls – Lots of cats have whisker sensitivities when eating. 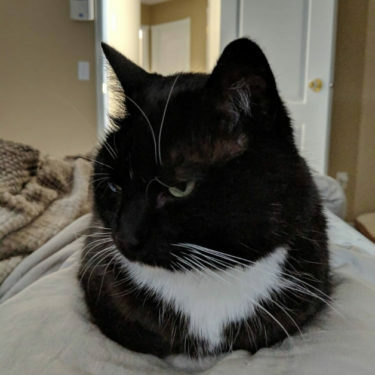 You'll want to make sure the food bowl you choose is wide and shallow enough that your cat won't be bothered by their whiskers touching the sides.